A mandala is a sacred circle. Mandalas can be found throughout nature, right down to the cellular level. We are literally swimming in a universal tapestry of interwoven sacred circles. I believe there is a function or an unmet need behind every behavior. When we look deeply enough we are able to understand the cause/source of the behavior. When the unmet need is met, we often see a reduction in the behavior’s intensity and/or duration. Children demonstrate a variety of behaviors when they are experiencing stress and tension. Re-establishing a sense of calm, peace and wellbeing is often connected to re-establishing feelings of organization, safety and predictability. When we establish a container or space for the disorganized thoughts and feelings, in a safe, consistent environment, we can enhance feelings wellbeing and harmony . When children are feeling stress or tension, it is often related to disorganization within their own minds or within the environment around them. When the disorganization is contained or brought into balance, there is often a greater experience of peace and wellbeing. Coloring mandalas or creating art within a contained, safe, predicable space, is a way to restore a greater sense of balance, harmony and increased wellbeing. 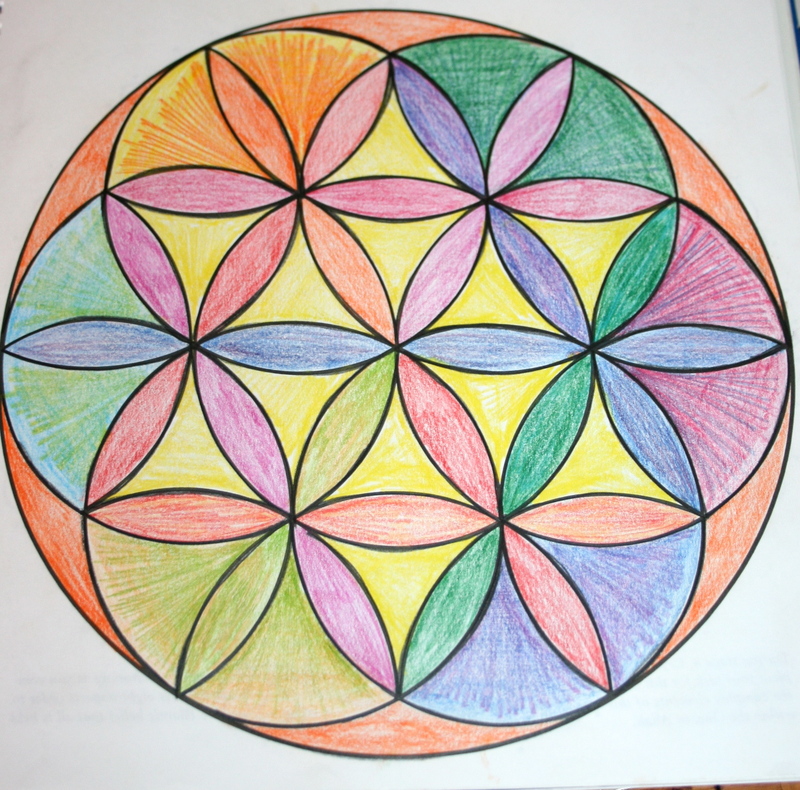 Explain to children that today we are going to color mandalas and a mandala is a sacred circle. Cultures around the world have used them for many different reasons. Native Americans have created sacred healing circles and dreamcatcher circles that catch dreams. Psychologists in the past have used them to explore emotions or unknown thoughts that are getting in the way of progress. In the religion of Buddhism, monks create sand mandalas that take many months to complete and then sweep them away in order learn about and celebrate change. The circle represents connection. It represents a container. Our classroom (our home) is our container. We get to decide what we put in it. One way that we can increase feelings of calm, focus, concentration and peace in our space is to color mandalas. As we are feeling more peaceful while we are coloring, we are adding peace to our designs and our space. We can practice thinking peaceful thoughts while we are coloring or we can simply allow our minds to relax as we are focused on our creating. As you are coloring allow the colors to “choose you”. Just relax your mind. You don’t have to think very much about the “right” color or the color that your friend is using. Just allow yourself to color exactly as you want to in this moment. (This works best if each child has his or her own set of coloring utensils). Use before tests in order to establish peace and calm in the environment and focus the mind. Use as a possible de-escalation technique when a child is in a heightened state of emotion in order to provide an opportunity to express through art and possibly enhance receptivity for further discussion or processing of the emotions. Create classroom peace visions by creating a larger collaborative class mandala on butcher paper. Have each classroom in the school create a “class mandala” for display. Send mandalas as messages of peace to neighbors, other classes within the school or other cultures. Set up a mandala exchange much in the “penpal format” with another culture and send mandalas back and forth instead of or in addition to letters.